Preheat your oven with a cast iron skillet on the middle rack to 260 degrees for at least an hour. While it's preheating leave the, rub olive oil all over your chicken, making sure you get into all the nooks and crannies - this is going to help crisp the skin up. Squeeze the juice of half a lemon all over the chicken, season with a significant amount (more than you think you need) of coarse sea salt and freshly cracked pepper, a sprinkle of dried thyme and then stick the squeezed lemon into the chicken's cavity. Leave the chicken in this state on the counter until the oven is heated. 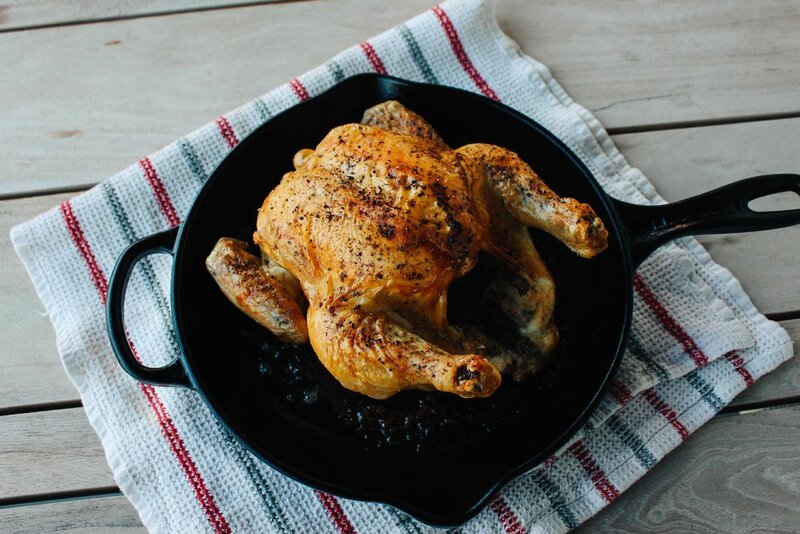 Once the oven and skillet have preheated, remove the skillet from the oven using an oven mitt, and gently place the chicken into the centre of the skillet - it should sizzle instantly. Place the skillet and chicken into the oven and cook at 260 for 15 minutes. Then turn the oven down to 180 degrees and leave to cook until the outside is golden and crispy and the internal temp reads between 60-70 degrees celsius - this should take about 30 minutes. Remove from the oven and and from the skillet let rest for 10 minutes before carving. BONUS: Put the skillet with all of chicken juice onto the stove on low heat. Add a diced shallot, 2 Tbsp of butter and a half cup of white wine. Reduce, whisking regularly until it’s the texture of gravy and serve on the chicken.